Tragedy will/does not define Barcelona. I was not surprised by the number of nations represented by the casualties. This is a city of the world. Where Córdoba is a city of insiders, Barcelona is a city of outsiders. My adjectives for her would be happy revolution. Whether it is of spirit, art, architecture, cuisine, social constructs, life and government. It is a quirky place. Your heart beats just a little faster there. I was very excited sitting working at this site. I looked up and Sol, from Seville, was standing before me. As before, while I painted, Sol filled me in on the history of the design and construction. 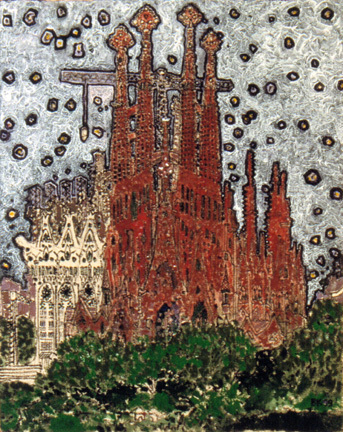 Designed by Gaudi in 1882, construction is scheduled for completion in 2026. I always figured Theodor Geisel must have been influenced Gaudi. I love this painting. It was a fine day. I was in a good place. This is my postcard from Barcelona.